When it comes to scheduling employees, restaurants have a lot of choices. There’s paper, sticky notes, emails and spreadsheets. But as managing labor gets more complex and employees turn more and more to their phones, these old-school methods just aren’t getting the job done. 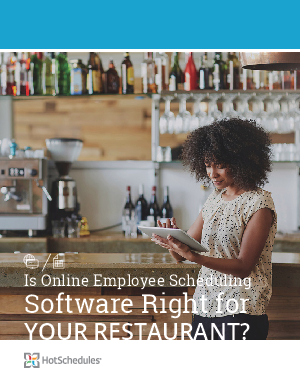 This puts most restaurant operators in one or two categories: either they’ve already adopted an online scheduling software to manage their workforce, or they know they need to make the switch. This ebook will show you how easy it is to use employee scheduling software and how much time it can save everyone in your organization.